Chabad of Northeast Queens is dedicated to serving Jews of all ages regardless of religious background or affiliation. Comprising multiple services and programs, Chabad of Northeast Queens provides the education and means to promote Jewish awareness, knowledge and practice through outreach, education and social services ensuring Jewish continuity. Chabad encourages positive action on the part of every Jew and facilitates the efforts of every organization or group to increase Jewish knowledge and observance. Chabad of Northeast Queens is part of the worldwide Chabad Lubavitch Movement. Chabad Lubavitch branches are present in every major Jewish city in the world. Uniquely each location is funded individually from its own fundraising campaigns and charitable givings of individuals. Your support helps us continue our vital work, reaching thousands of Jews throughout the Northeast Queens area, and beyond. Make a contribution in your name or in the name of a loved one. Chabad of Northeast Queens. is a non-profit organization. All grants and charitable contributions are tax-deductible. Make a donation in honor of somone who inspired you. Security: Chabad ofNE Queens uses technology that encrypts all information from the end-user to the web server. This is known as SSL encryption. In fact we use the highest form of this encryption, 128 bit SSL encryption. Secure pages are identified by the "lock" icon in your browser and by the web address beginning with "https://"
You may choose to have this payment be scheduled as a monthly payment. 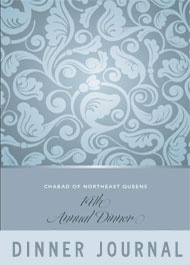 Chabad of NE Queens Inc. is a non-profit organization. All grants and charitable contributions, are tax-deductible. A Tax reciept will be issued and sent to the above name and address unless otherwise noted. Thank you for you Support.